Amtrak, on the other hand, has a less ambitious view of the future for the nation’s busiest rail corridor. Its new master plan calls for spending $52 billion by 2030 to cut travel time by about 20 minutes between New York and Washington and between New York and Boston. It envisions reducing travel time between New York and Philadelphia by four minutes. “Amtrak’s new plan leaves you with a really good early-20th-century rail system,” said Robert Yaro, one of two Penn professors who taught the students in the School of Design’s department of city and regional planning. Yaro is also president of the Regional Plan Association, a New York-area research and policy group. Amtrak’s vision of the future, unlike the students’, does not include true high-speed travel, with trains operating at least at 155 m.p.h. on dedicated tracks, free of conflicts with commuter or freight trains. The Penn students aren’t the only ones with higher hopes for fast trains in the Northeast Corridor. Ten other U.S. rail corridors have that designation (including the Keystone Corridor between Philadelphia and Pittsburgh), but not the Northeast Corridor, which has the nation’s fastest trains. “This lack of designation shuts states along the NEC out of competing for . . . grant money available to other rail lines, and has already resulted in the NEC missing out on adequate funding for badly needed infrastructure upgrades and rail-expansion projects,” Castle, Sestak, Pascrell, and four other representatives said in a recent letter to House leaders. 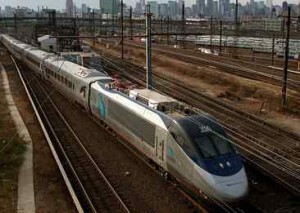 They asked for congressional hearings on high-speed rail development in the Northeast Corridor. Federal Railroad Administrator Joseph C. Szabo said last week that a new national rail plan to be issued Sept. 15 would make clear the importance of the Northeast Corridor for high-speed rail. 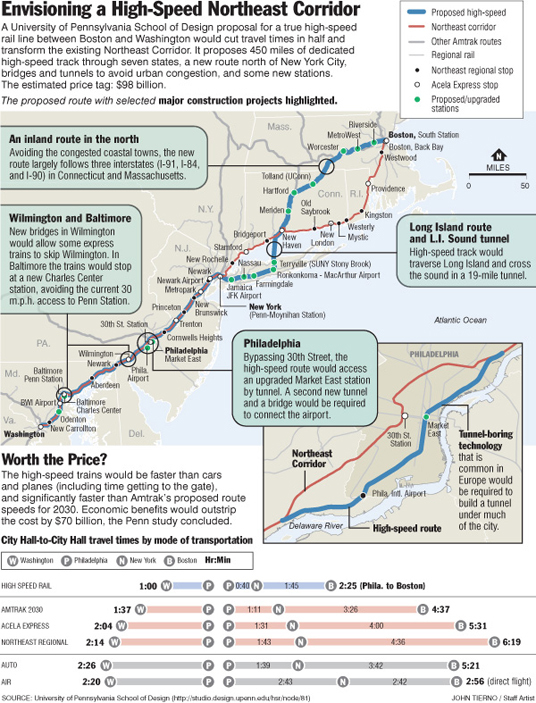 He said current distinctions between the designated “high-speed” corridors and the Northeast Corridor would be erased. “There’s no question the Northeast will be an integral part of high-speed rail development in this country. . . . The demographics are just too perfect for it not to be,” he said. “If Amtrak hadn’t screwed it up, they could go much faster,” he said, blaming political intransigence and decade-old problems with the construction of Acela trains. Amtrak officials say the new master plan is the starting point – not the end – for designing a high-speed future for the Northeast Corridor. A more visionary study is coming this summer, which will consider a true high-speed service on a realigned route, said Stephen J. Gardner, Amtrak’s vice president for policy and development. “This is the best shot we’ve had in decades to make the case and build the political consensus” for better, faster Northeast service, Gardner said. Amtrak and 11 Northeastern states in May asked the Federal Railroad Administration to do such an environmental study as part of a comprehensive examination of passenger rail’s future in the corridor. Amtrak calls its current Acela trains “high-speed,” based on service that can reach 135 m.p.h. between New York and Washington and 150 m.p.h. for a brief stretch between New York and Boston. But the average speed for the Acela trains is considerably lower: 81 m.p.h. between New York and Washington and 65 m.p.h. between New York and Boston. The Penn plan would cut travel times in half. A trip between Philadelphia and New York would take 37 minutes instead of the Acela’s current one hour, 12 minutes. A trip between Washington and New York would take 1 1/2 hours instead of the current two hours, 45 minutes, and a trip between New York and Boston would be one hour, 45 minutes, instead of the current 3 1/2 hours. The Penn students envisioned about 100 miles of tunnels, including beneath downtown Philadelphia and Baltimore to provide fast, direct routes to new downtown stations. And they suggested a new route from New York to Boston – beneath Long Island Sound and inland through Connecticut and Massachusetts. Amtrak’s existing Northeast Corridor main line between Washington and Boston is the busiest route in the nation, carrying about 11 million passengers a year. It features the Acela, the closest thing the United States has to a high-speed train. Penn’s 18 School of Design students, after a trip to Britain to study plans for high-speed rail service between London and Scotland, drew up a plan for a remade Northeast Corridor based on new construction and railroading technology. The official new plan for the corridor’s future, created by Amtrak, state, and commuter and freight rail representatives in the Northeast Master Plan Working Group, is focused on incremental improvements to bring the 457-mile corridor into a state of good repair. Although the plan invokes the exhortation of the Chicago architect and city planner Daniel Burnham to “make no little plans” and to “think big,” it limits itself to relative baby steps into the future. By contrast, high-speed trains in Europe and Asia for years have operated at 186 m.p.h. over long stretches of dedicated track. Several routes in China have trains moving at 220 m.p.h., and French train-maker Alstom’s new AGV trains are designed to operate at 224 m.p.h. Amtrak, with capacity problems and curving tracks, won’t be able to take full advantage of even the modest increase in top-speed capabilities: The goal for Acela service between Washington and New York by 2030 is set at 2:21 instead of the current 2:45 (with a two-stop express that could make the trip in 2:15), and the goal for New York to Boston is 3:08 instead of the current 3:31. The goal for Amtrak “regional” trains that run from Philadelphia to New York is 1:16 by 2030 instead of the current 1:20. Amtrak’s trip-time goals for 2030 are about the same as the ones set by Congress back in 1976. At that time, Congress told Amtrak to run three-hour service between New York and Boston and 21/2-hour service from New York to Washington. Amtrak’s share of the train/plane traffic between Washington and New York has grown from 37 percent in 2000 to 63 percent. On the New York-to-Boston route, Amtrak’s share has grown from 20 percent to 49 percent. To get a significant number of motorists off the Northeast’s congested highways will require a much more robust passenger railroad. That will mean spending far more than the $52 billion proposed for bringing the existing service into good repair, said Amtrak’s Gardner. “I think it’s clear that a major investment will reap huge benefits,” he said. The students’ plan has caught the attention of the Federal Railroad Administration, which is preparing a comprehensive National Rail Plan for release next month. FRA deputy administrator Karen Rae called the Penn plan “a very dramatic vision . . . and the challenge it raises is how significant an investment are we willing to make?” She said states must share the costs.